The Other Side blog: 1,000,000 Page Views! 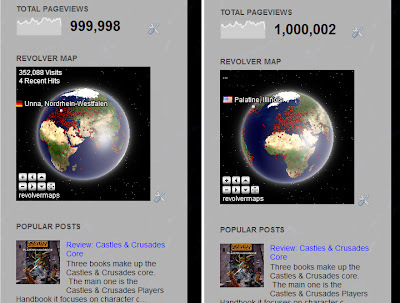 I hit 1,000,000 pages views earlier today! Planning some stuff to celebrate! Keep an eye open. Congrats! Seems our blogs are pretty much neck-and-neck! Hi Tim - not at all shabby I'd say .. congratulations - amazing numbers! Thanks all! I hope to have something cool planned. Over what span of time? @John, since I started. Should take me (at current rates) 3 years to get to my next million!